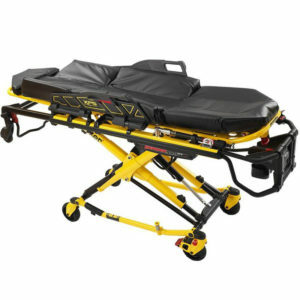 The 6085 Ambulance Cot is a non-powered stretcher consisting of a platform mounted on a wheeled X-frame that is designed to support patients in a horizontal position for transport or administration of medical care. The Performance-PRO XT has side rails, supports for fluid infusion equipment, and patient restraint straps. The frame is collapsible for use in ambulances. The Stryker 6085 Performance-PRO XT Ambulance Cot is available in a variety of configuration options to best fit the patient and caregiver’s needs. XPS Expandable Patient Surface: Expandable patient surface (XPS) system increases patient surface area. Designed with your patient’s safety and comfort in mind. Reduces patient transfer gap. Power-LOAD Power Loading Fastener: The Power-LOAD stretcher fastener system improves operator and patient safety by supporting the stretcher throughout the loading and unloading process. Lifts or lowers the stretcher into and out of the ambulance, eliminating spinal loads that can result in cumulative trauma injuries. Light enough to move well. Advanced enough to breathe well. The LTV 950 incorporates many of today’s more advanced modes of ventilation in a versatile 13.4 lb (6.1 kg) design for maximum mobility. It features pressure control, pressure support, NPPV, adjustable flow-triggering and an apnea backup mode. Innovative technology and enhanced portability merge, enabling ventilator patients to be more mobile and comfortable. The LVT 950 incorporates many of today’s more advanced modes of ventilation in a versatile 13.4 lb (6.1 kg) design for maximum mobility. It features pressure control, pressure support, NPPV, and more. MRES is a software for medical transportation companies that is designed as dispatching software to assist medical transportation companies. The ARC ePCR® software allows ambulance crews to quickly and securely complete patient care reports that are electronically sent to us.